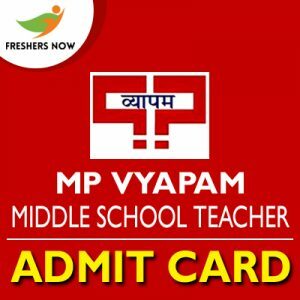 MP Vyapam Middle School Teacher Admit Card 2019: Good News for the Candidates that the MP Vyapam Middle School Teacher Hall Ticket 2019 is Released On 8th February 2019. The higher authorities also declared the Scheduled MP Vyapam Middle School Teacher Exam Date 2019. So, the candidates should prepare well for the Exam. Before that, the candidate should know the MP Vyapam Middle School Teacher Selection Process 2019 to attempt the Online Exam. Moreover, go through the complete details and check the Direct Download links given at the bottom of the page. The Selection Process will be decided by the Selection Committee of the Madhya Pradesh Professional Examination Board. This is called the qualifying process and moreover, it includes only two rounds such as Online Examination followed by the Personal Interview. So by referring to this section, the candidates will get a clear idea of the MP Vyapam Middle School Teacher Selection Process 2019. The Officials of the Madhya Pradesh Professional Examination Board released the Exam dates for the MPPEB Middle School Teacher Exam 2019. The Scheduled Exam Dates for each and every subject along with the Exam timings are provided in this section in a PDF Format. Moreover, the Exam Dates should be noted by every candidate because their peb.mp.gov.in Middle School Teacher Admit Card 2019 contains their specified subject exam date and exam center only. So candidates while downloading the Admit Card you should enter the correct details. Candidates are advised to keep their MP Vyapam Middle School Teacher Hall Ticket 2019 safe till the joining. Admit Card will be required at the time of joining. Candidates should bring the printout of their peb.mp.gov.in Middle School Teacher Admit Card 2019 to the examination hall. You will find the home page of the Madhya Pradesh Professional Examination Board on the screen. Then, simply search for the MP Vyapam Middle School Teacher Recruitment 2019 and click on it. Now you will find a new page. And then search for the MP Vyapam Middle School Teacher Hall Ticket 2019 Link and click on it. Fill the details asked for and submit all the details. Now, the Hall Ticket appears on the screen. Finally, Download it and keep it safe for future use. Similarly, you can get more such details as MP Vyapam Middle School Teacher Hall Ticket 2019 by bookmarking our website Freshers Now. Drop a comment for any queries.